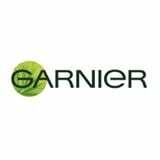 Spring is a season filled with fresh scents, which is why we partnered with Garnier Whole Blends for these floral arrangements inspired by several of the wholesome ingredients in its products. Adding flowers to your space instantly gives it a fresh lift. There are so many scents and ingredients you can use when putting together floral arrangements, like coconut and vanilla. Incorporate them with blooms for an interesting and unique spin on traditional arrangements. The result is pretty and so inviting. 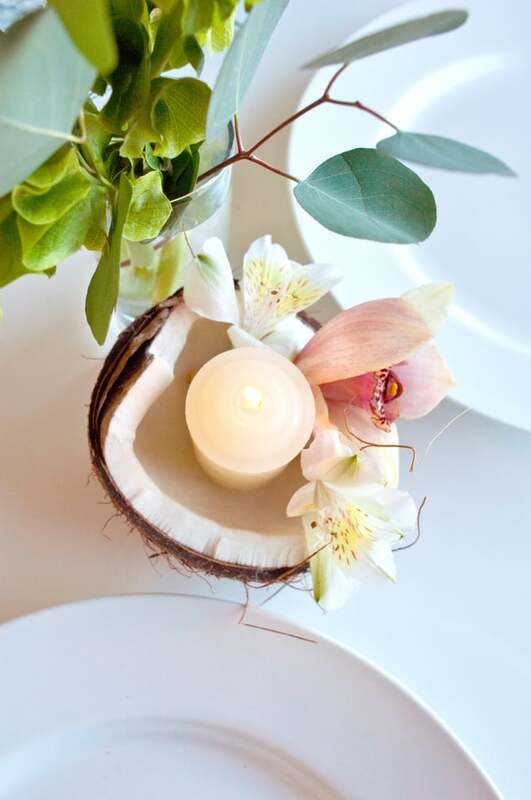 Use half of a fresh coconut as a votive holder for a unique look for your table. 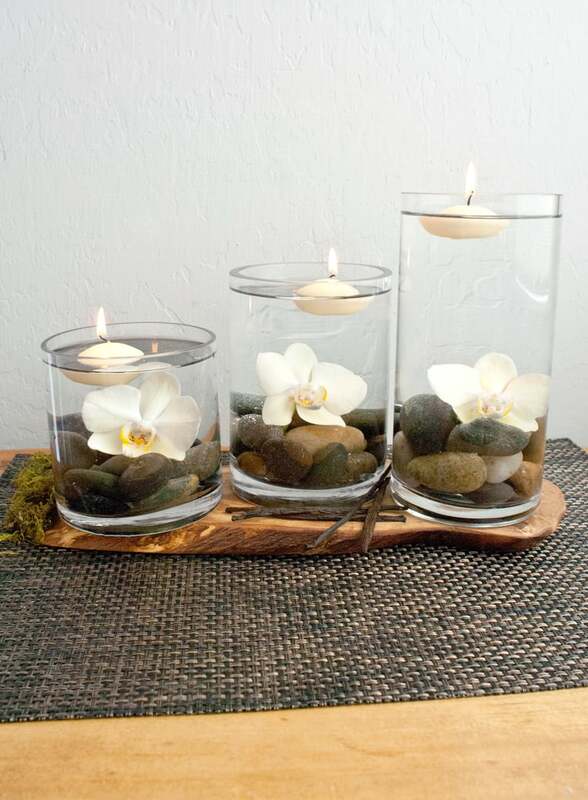 Add a vanilla tea light and surround with orchids and lilies. 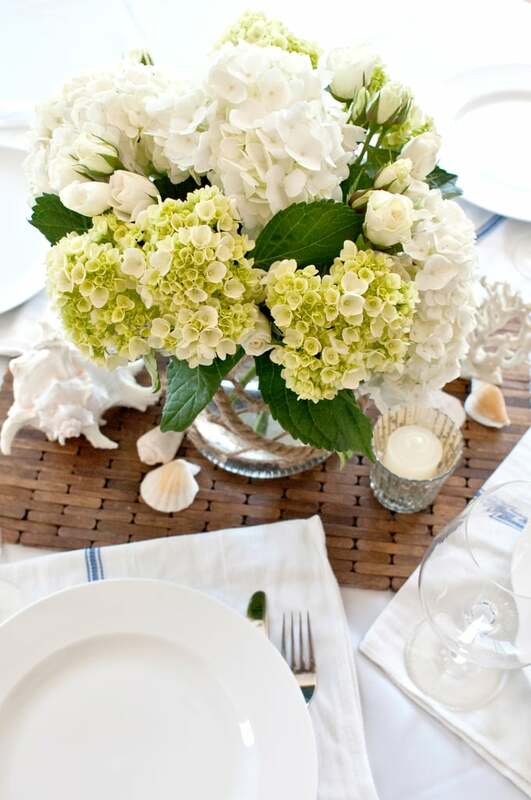 The combination of hydrangeas and tea roses blend so well with nautical touches, like seashells and citrus candles that take you straight to the beach. 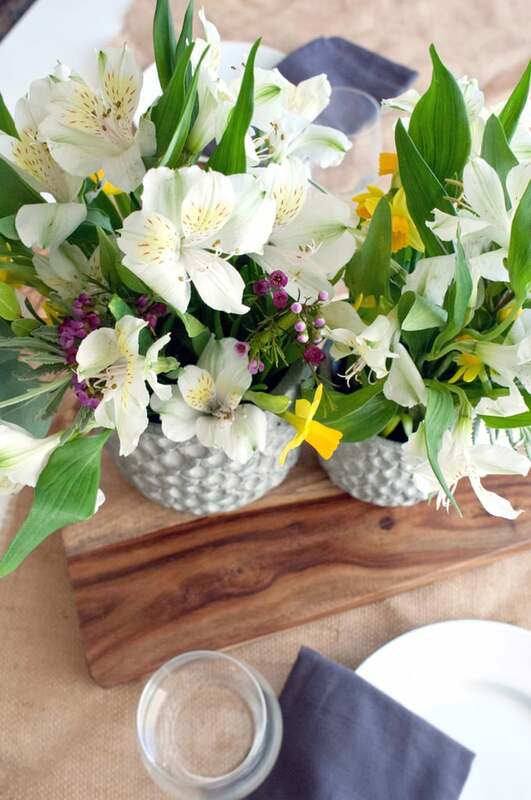 Another fun spin on a typical floral arrangement for Spring is to use garden pots instead of a vase. Go with ones that don't have holes in the bottom and place on a cutting board or serving tray. Then fill with water and lots of Spring blossoms, like lilies and baby daffodils. Infuse your space with the scent of vanilla thanks to adding whole pods to a floral arrangment filled with roses and wildflowers. 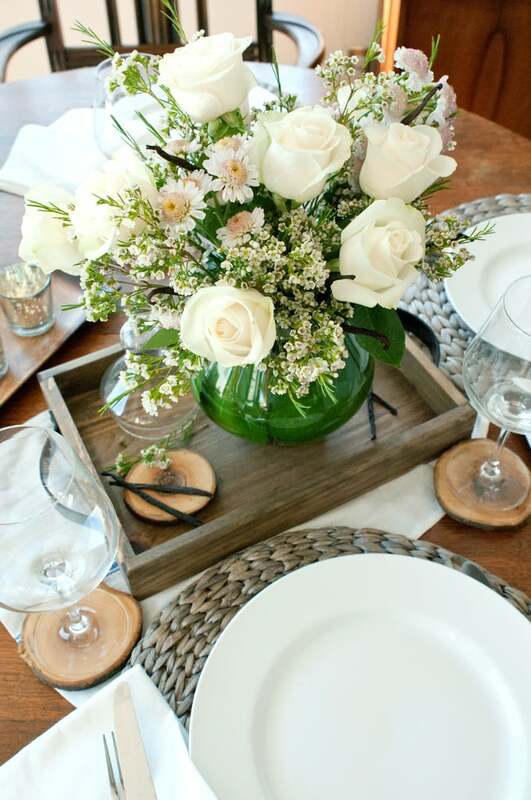 Surround the arrangement with other natural items, including more vanilla, for a tablescape that will definitely wow. If you're looking for a unique spin on adding a touch of flickering light a side table or buffet, use varying-sized vases for floating candles. Start with a base of river rock, then nestle in orchids. Fill with water and then vanilla floating candles. Surround with more touches, like moss and vanilla. Now that your table is looking beautiful, it's time to focus on you! 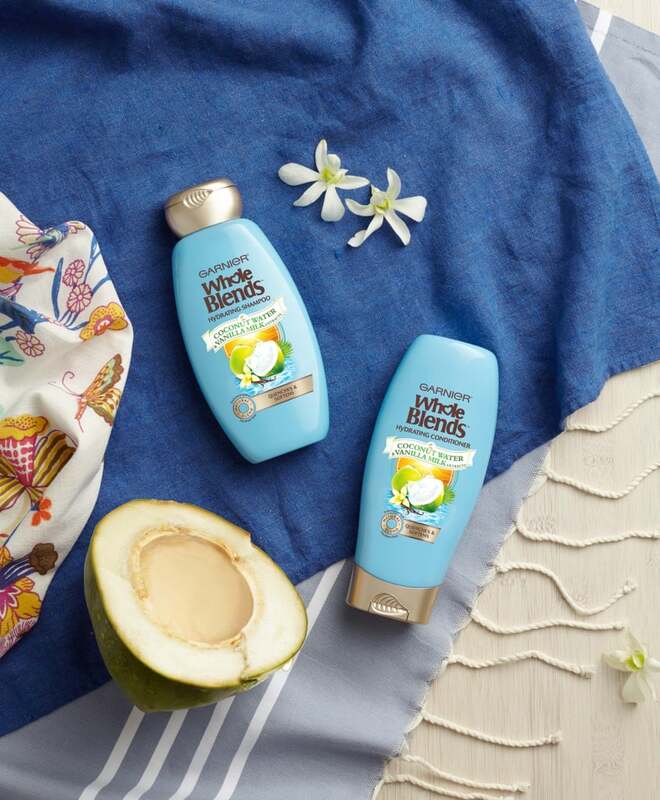 By blending wholesome ingredients, Garnier has found a way to hydrate even the thirstiest hair with Whole Blends Coconut Water & Vanilla Milk Hydrating products. It uses paraben-free formulas to replenish, hydrate, and soften your naturally beautiful hair. Find your blend.